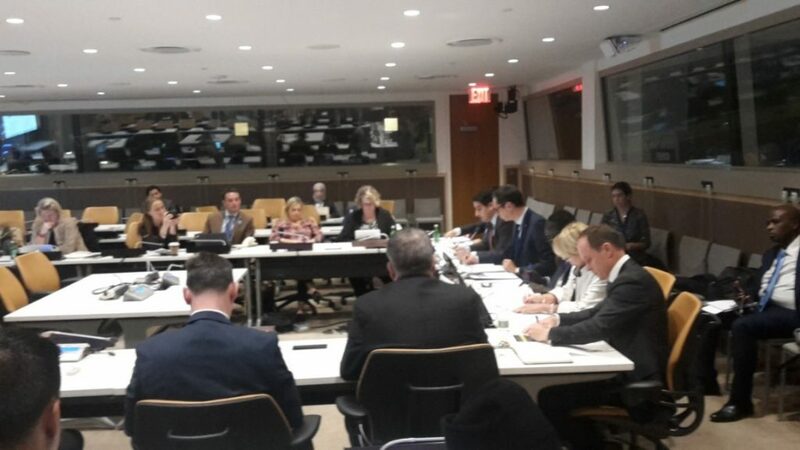 On Thursday, 25 October 2018, the Permanent Mission of France convened a panel presentation entitled “A New Ambition to Defeat Improvised Explosive Devices (IEDs)”. Ambassador Yann Hwang, the Permanent Representative of France to the Conference on Disarmament and chair of the event, recalled the tragic November 2015 Paris attacks that brought IEDs to the fore of public awareness. Ambassador Hwang also noted France’s engagement in several operations abroad, including Mali, where IEDs are a daily and deadly hazard to military personnel and civilian populations. In Afghanistan, there have been over 2,300 civilian casualties caused by more than 90 IED attacks in 2018 alone, said Ambassador Nazifulah Salarzai, Deputy Permanent Representative of Afghanistan to the United Nations. IEDs are an urgent issue affecting more than one-third of Member States. Ambassador Salarzai lamented that Afghans live in constant fear of the next explosion because of the unpredictable nature of IED attacks. He further noted that non-State actors have started to design IEDs to specifically target humanitarian actors. In attacks that incorporate such devices, an IED detonation attracts responders such as medics and police who are then targeted with a second IED. Afghanistan has for several years sponsored the General Assembly resolution “Countering the threat posed by improvised explosive devices”, and it intends in the 73rd session to add language on data collection, information exchange and the private sector. Ambassador Issa Konfourou, Permanent Representative of Mali to the United Nations, outlined the threat of IED attacks by various groups in Mali and underscored that IEDs are a major threat to the peace process there and in neighboring countries. Ambassador Konfourou expressed specific regret that the use of IEDs hinders the movement of civilians in daily life. Ms. Agnès Marcaillou, Director of the UN Mine Action Service, emphasized that the United Nations prioritizes the prevention of IED attacks. The most important factor in mitigating the impact of IED attacks is training, Ms. Marcaillou repeatedly underlined. Through training, UNMAS has been able to reduce casualties among employed personnel by up to 80 per cent. Other important steps to combat IEDs include effective stockpile management, which can curb access to materials that could be used in the manufacture of IEDs, as well as risk education. She noted that such education must be tailored to the target community, including through gender and age mainstreaming. Ms. Marcaillou further reflected upon the efforts of the UN system to respond to the IED threat, including through the development of the UN IED Disposal Standards. She also noted that the Secretary-General’s Disarmament Agenda includes a commitment to promote a more coordinated, coherent UN response to IEDs. Brigadier Jonathon Beesley, former Commander of the Joint Counter Improvised Threat Task Force of the Australian Defense Forces, explained how the Australian military cooperates with private industry and the Australian science and technology community to develop force protection electronic countermeasure systems. Electronic countermeasures are devices aimed at interfering with military electronics—in this case, electronics used in IEDs—to render them harmless. The system has been employed in cooperation with the Afghan Armed Forces in the NATO Resolute Support Mission in Afghanistan. Brigadier Beesley noted that, in addition to providing protection to soldiers, the system’s use has helped to build trust and confidence among foreign militaries. Mr. Himayu Shiotani, Programme Lead of the Conventional Arms Programme at the United Nations Institute for Disarmament Research, offered concluding remarks from a research perspective and reflected on potential areas for future progress. Mr. Shiotani argued that IED production on the ground has reached an industrial level, resulting in danger further exacerbated by the increased sophistication and variety of materials used. With a view to improving prevention efforts, Mr. Shiotani suggested several options: strengthening regulatory frameworks for military and commercial components potentially used in IEDs; enhancing risk assessment to understand vulnerable factors in their supply chain; and enhancing information sharing among affected agencies and industry actors.